Abel Nightroad is hot. Of course, that could be my vampire hunter fetish speaking. Either way, he's hot, and here's a wallpaper of him. Eat your heart out. Based on the ending theme, for the title and for the snowy-graveyard ambience. Stock and textures from sxc.hu. Special thanks to Tama-Neko for some textures and brushes. This is very beautiful. I love the paperlike texture throughout the image. The background frames the emotion depicted by the scan beautifully. Oh wow thats one cool lloking wall from you. I really love the Background and the Dark-Purple Colors you used.They fit in great. 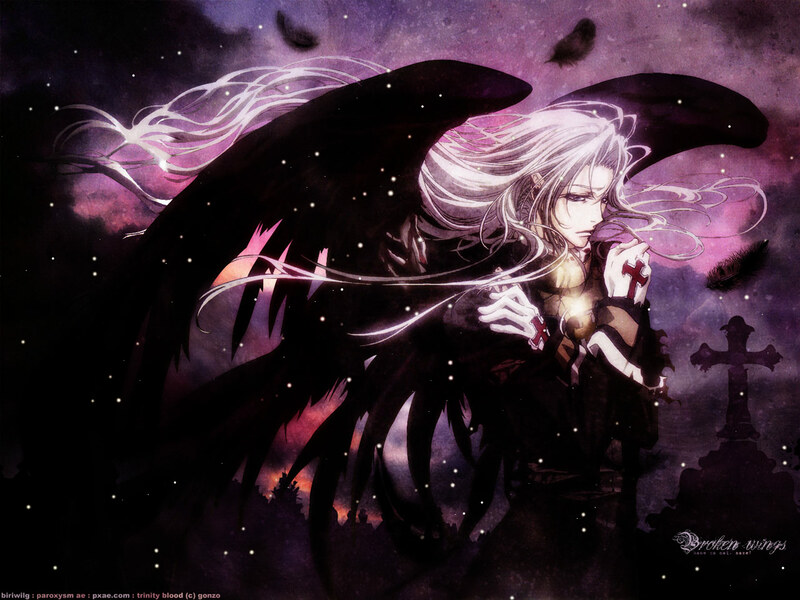 Its a shame that are not more Walls from Trinity Blood here. Glad you were able to use some of the textures and brushes on the site :D And huzzah for the Bishounen Invasion! i really like the lighting effects you've done on his body and hair. One last point - love the sky! Wow, beautiful wallpaper though it is really dark. I love the colors you used and the atmosphere you created with this whole wall is amazing. Overall the character and background are extremely well-integrated. I'd find it hard to recognise this as a wallpaper and not an original artwork if I saw it elsewhere! Finally a wallaper that deserve to downlod today! Okay Biri...you did gr8 once more! Wanna you to know that I love night wallies or wallies with dark BGs! ^__^ And this one ish no exception! I like a lot how you did the BG, those pinkish-Purple colors blend very well and fit the scan perfectly! I've seen a few episodes of BT. as long as it does not become violent as hellsing "that was just over kill"
anyway. i love the scan. wow!! abel rockz!! i love the demon wings!! the looky grunge bg is soo cool! i love the purple look sky! +fav! This is uber awesome!! Especially the background! You done a great job, biri!! Worthy of being in the top faves for a long time! !